A roundabout is scheduled for construction at the intersection of Rt. 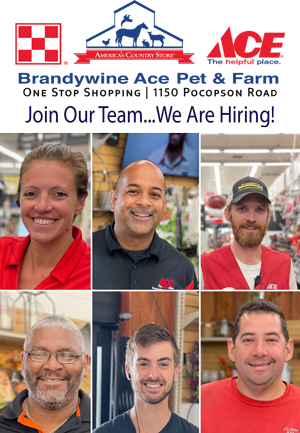 52, Wawaset Road, and Lenape-Unionville Road. The goal was roundabout, but the action was direct as the Chester County commissioners advanced a road project in Pocopson Township on Wednesday. 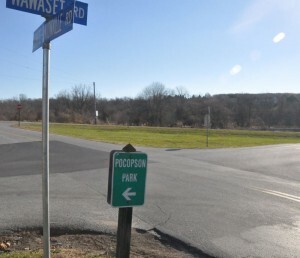 At their regularly scheduled meeting, the commissioners approved an intergovernmental cooperation agreement between the county and Pocopson Township that authorizes the Pennsylvania Department of Transportation (PennDOT) to install a “roundabout” at the intersection of Lenape Road, South Wawaset Road, and Lenape-Unionville Road. With a roundabout, a circular junction is created that slows traffic, which flows in one direction around a central island to access intersecting roads. Eugene Blaum, a PennDOT spokesman, said on Wednesday that the project is a partnership in which the township is responsible for the design, engineering, and land acquisition while PennDOT, which must approve the design, will finance and implement the estimated $1.8 million construction phase. George Gumas, the consultant project manager for PennDOT, said he expected construction bids to be opened in September. Work could begin as early as mid-November, he said, depending on weather conditions. He estimated the project would take about six months. The Pocopson Township supervisors approved the intergovernmental agreement on Feb. 11. It calls for the county to dedicate 1.9 acres of the nearly 90-acre tract it owns adjacent to the intersection for an additional right-of-way and to provide a temporary construction easement on more than half an acre of the county property. The project has been on the drawing board since at least 2007; an earlier design was rejected by PennDOT. Plans are to replace the existing stop sign that controls the intersection with a roundabout. In addition, the project involves the construction of approximately 2000 linear feet of new tie-in roadways to connect to the roundabout, and the relocation of the driveway to the county’s Pocopson Home. Under the terms of the agreement, the current access road to the Pocopson Home will not be closed until the new driveway is constructed. The roundabout configuration was selected as the best traffic-calming option for a difficult intersection that has been worsened by recent development in the area. Blaum said roundabouts are gaining in popularity. In addition to the fact that research indicates that traffic accidents are less severe, roundabouts can ease congestion without the expense and delays associated with a traffic light. Six or seven exist in the Philadelphia region, Blaum said, but they resulted from private enterprise. The Pocopson Township roundabout will be the first one in the area installed by PennDOT, he said. Likening roundabouts to “an acquired taste,” Blaum said some motorists unfairly compare them to New Jersey circles, which have been phased out due to their unpopularity and high accident rates. “That’s like comparing apples and oranges,” Blaum said. He explained that roundabouts use a tighter, less confusing configuration, confining traffic to a single lane. “I think as motorists get more accustomed to them,” they’ll be used more often, he said. Roundabouts are fine if needed. However I do not understand why the township is going to such expense to build one at this location. I have never seen any problems with this intersection…I have travelled these roads for over 50 years . My observation is that Rt 52 slows down naturally because of the curve. Perhaps I missed something but have there been many accidents there? Why would Pocopson pay for the engineering costs for a PenDot plan. That is absolutely ridiculous in my book. We have the million dollar plus plan for the Bernard House. There is also all the millions we gave away for supposed “open space” preservation. And now we have this. At least one supervisor was smart enough to vote no. Why didn’t the others follow suit. More spending in Pocopson. When will the insanity end. I’m OK with the roundabout, especially if it improves the sightlines coming north. I just hope that they agreed to move the driveway for the Pocopson Home over to S Wawaset Rd. Keeping it on Rt 52 complicates things and could cause back-ups into the circle. Route 52 is a state road. If there is a problem at this intersection the state should fix it. Why do Pocopson Twp taxpayers have to fund the design of a silly roundabout for a road that is used primarily as a pass through for non township residents? Pocopson Twp taxpayers get stuck with 100% of the design and other costs and a very small portion of any benefit. I’m glad at least Ms. Stumpo had the courage to vote for the taxpayers.